A crawfish is to a bass what a steak is to a cowboy - the ultimate meal! The Yum Crawbug is nature re-created. This bait is designed with three-dimensional features never before seen in a soft plastic lure. Amazingly realistic detail, a specially designed hollow body and super-soft texture combine to imitate a fleeing crawfish perfectly. 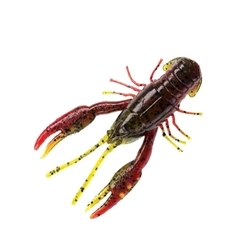 Add the Yum F2 Spray Attractant and you have the most lifelike crawfish imitation ever designed. You can flip it, rig it or jig it. This bait does its job!